Mark Striegl signed for ONE Championship with an outstanding record and an excellent reputation. He’s been one of the biggest names in Asian MMA for several years and is a fan favorite in the Philippines. After years of competing for smaller promotions all around the region, the 28-year-old decided to put pen to paper on a long term ONE Championship contract toward the tail end of 2014 in order to pursue his ambition of becoming a world champion in MMA. Striegl suffered a setback when he was stopped by Reece McLaren last year, but the Fil-Am fighter is determined to get his career back on track. He’s up against Sotir Kichukov at the Mall of Asia Arena on Friday night and knows he needs to win to keep those title dreams alive. 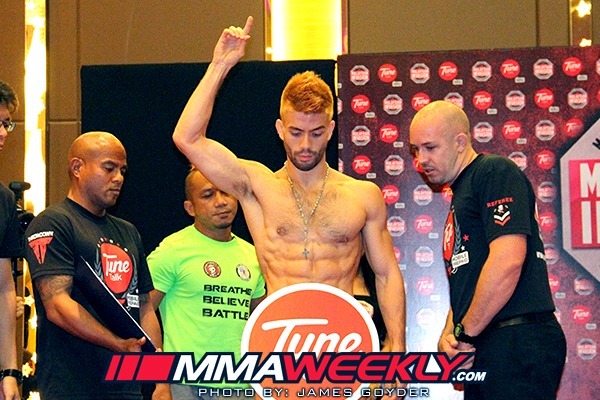 Striegl is a member of the fight team at Evolve MMA in Singapore and normally conducts his fight camps there. However, ahead of his third ONE Championship bout, the bantamweight has decided to stay closer to home.